Congratulations! You just found out that you are pregnant with twins! Now what? You may be feeling a mix of emotions: shock, happiness, anxiety, excitement, or maybe complete fear. How are you going to be able to take care of two babies at once? Are you going to need to buy two of everything? Can you handle it financially? All of these questions may be running through your head all at once, along with the most immediately pressing concerns about the pregnancy. Take a deep breath, and start with these four questions to ask your doctor. I will also give you a quick crash course in twin pregnancy education, including an interesting fact your doctor may not even know. 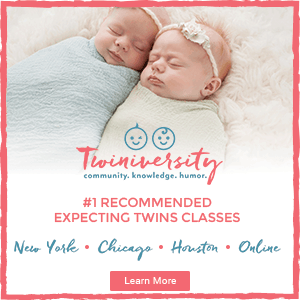 The first question you will want to ask is one your doctor will probably address during your first appointment: What type of twins do I have? There are three types of twin pregnancies, and each one has different levels of risk. Most twin pregnancies are automatically considered high risk (don’t let that scare you), but some are riskier than others. The three types of twins are dichorionic/diamniotic (di/di), monochorionic/diamniotic (mono/di) and monochorionic/monoamniotic (mono/mono). In the simplest of terms, di/di means two sacs, two placentas. This is the lowest risk of twin pregnancies. Mono/di means two sacs, one placenta. Mono/di is riskier than di/di because of the possibility of twin to twin transfusion syndrome (TTTS), where one twin may take more nutrients from the shared placenta. Mono/mono means one sac, one placenta, and this pregnancy, while thankfully rare, is very high risk. Since the twins share a placenta there is the potential for all of the issues that come with mono/di like TTTS, and other serious problems like cord entanglement. If you do end up being one of the few with mono/mono, you will be monitored super closely, so try not to worry just yet. Take note that in the very beginning many mono/di pregnancies look like mono/mono because sometimes the two sacs aren’t visible until at least 12 weeks. Before I address the next question to ask, here is an interesting fact that your doctor may not know, since it doesn’t pertain to how the twin pregnancy is treated. Many doctors will tell you that di/di twins are fraternal (meaning dizygotic, coming from two separate eggs). This is a common misconception. Di/di twins can actually be identical (one egg splitting). Mono/di and mono/mono are always identical, but in a small percentage of monozygotic pregnancies, the egg splits very early after fertilization, early enough that each embryo ends up with its own sac and placenta. If the embryo splits very late, you end up with mono/mono twins. Conjoined twins result from an even later split. If you have di/di twins, they could be identical, and unless they are boy/girl, you won’t know until they are born, or you may have to do a DNA test to find out for sure. 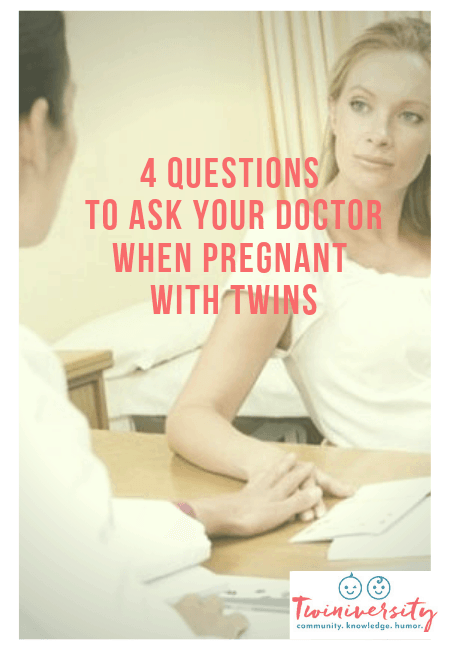 The second question you will want to ask your doctor is: How will my twin pregnancy be different than a singleton pregnancy? One thing you can pretty much count on is more monitoring. How much extra monitoring depends on the type of twins as well as other factors like your age, overall health, and previous pregnancies. A twin pregnancy puts you at higher risk of preterm labor and complications like preeclampsia and gestational diabetes. The babies will also be monitored more closely in their growth. Some extra monitoring you may have during a twin pregnancy could include extra ultrasounds, non-stress tests (NSTs), and biophysical profiles (BPPs), as well as more frequent appointments than a singleton pregnancy. I had di/di twins, and I had weekly appointments from 28 weeks on, including bi-weekly NSTs after 33 weeks, and monthly growth ultrasounds from 20 weeks on. Ask your doctor how much monitoring you will be receiving, and no matter what, be prepared for extra appointments. Along with extra monitoring, another question you should ask is: Will I need to see a specialist? If you have mono/di or mono/mono twins, seeing a specialist is a must. You will most likely see a maternal-fetal medicine (MFM) specialist in addition to your OB-GYN. The MFM will be responsible for many, if not all, of your growth ultrasounds and will be watching your twins very closely for complications like TTTS. One way to think of an MFM is as your babies’ doctor, while your OB-GYN is your doctor. 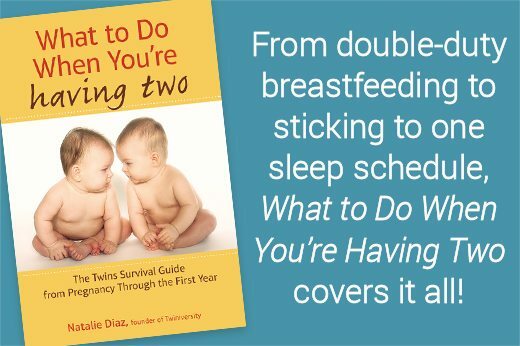 If you have di/di twins, whether you see an MFM is up to you and your OB. 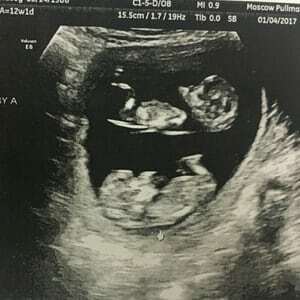 I did not see an MFM during my di/di pregnancy, but my OB’s office was also very experienced with twins and they had good ultrasound equipment for growth ultrasounds as well as everything needed for NSTs. If your OB practice is small or is not experienced with twin pregnancies, you may want to see an MFM, even for a di/di pregnancy. Ask your doctor for a referral. Finally, if you are pregnant with twins you are probably wondering: How will having twins affect delivery? Will I need a c-section? Talk to your doctor early and often about delivery plans. Each doctor is different in their views on delivery, and a lot depends on both the babies’ positions as well as your overall health and the risk of your pregnancy. No matter what, you should be prepared for the possibility of a c-section from the very beginning. Many twins are delivered vaginally, but the chances of complications are higher, and many doctors have stipulations about what is necessary to deliver vaginally. For example, some doctors require that both babies be head down, but some only require that the first baby (baby A) be head down. Some doctors are comfortable with delivering baby B breech (this is called a “breech extraction”), some are not. Many doctors will also require that an epidural be placed or that you deliver in the O.R. in case a c-section becomes necessary. Another possibility is that you could deliver baby A vaginally but then need a c-section for baby B. I agonized over attempting a vaginal delivery for my twins, but my twin A ended up breech, so I had a scheduled c-section. Having the decision made for me was actually a relief in the end. Also, expect to deliver early. Most doctors will deliver di/di twins by 38-39 weeks, and mono/di and mono/mono even earlier. Therefore, a NICU stay for the babies is also a distinct possibility. Each pregnancy and each delivery is unique, even with a singleton, so make sure you are continually talking to your doctor about delivery plans, especially toward the end when your babies may (or may not) settle into their final positions. 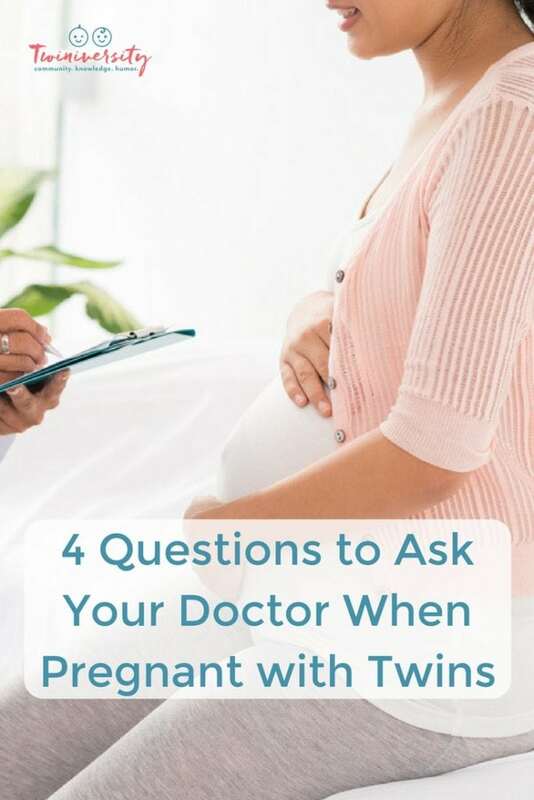 Hopefully, after reading, this your mind is a little more at ease about what to expect during a twin pregnancy, and you know where to start with questions for your doctor. Take a deep breath, enjoy the ride, and mentally prepare yourself for whatever may come. Chances are everything will be fine, and in just a few months you will be holding your sweet little twins in your arms. All content on this Website, including medical opinion and any other health-related information, is for informational purposes only and should not be considered to be a specific diagnosis or treatment plan for any individual situation. Use of this site and the information contained herein does not create a doctor-patient relationship. Always seek the direct advice of your own doctor in connection with any questions or issues you may have regarding your own health or the health of others. 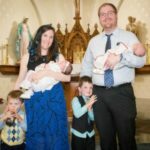 Sarah Morel has been married to her wonderful husband for seven years and is a stay at home mom to four kids five and under, including one-year-old twins. She spends most of her days chasing her boys around, caring for babies, or struggling to keep the house clean. In her limited spare time, she enjoys spending time with family and friends, reading Harry Potter and young adult fantasy, chatting with other parents on internet forums, and writing. You can find out more about her on her blog. Got twins? Us too! The Twiniversity Podcast with Natalie Diaz is created by parents of twins FOR parents of twins, from expecting times through the teenage years and everything in between. 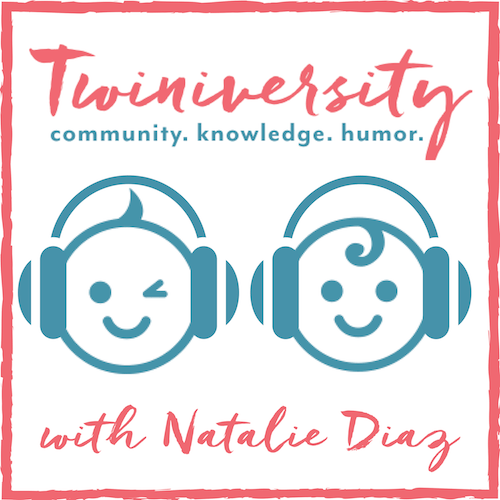 This podcast is all about parenting twins, offering plenty of tips, parenting hacks, and of course, humor. Just know that we are laughing WITH you every step of the way. Are you looking to connect with an experienced parent of multiples who has been in your shoes? Do you want to feel supported, guided, and heard as a new parent of multiples*? Or, do you love offering advice and tips to new parents of multiples*? Would you love to support, guide and listen to a soon-to-be or new parent the way you wish someone was there for you? 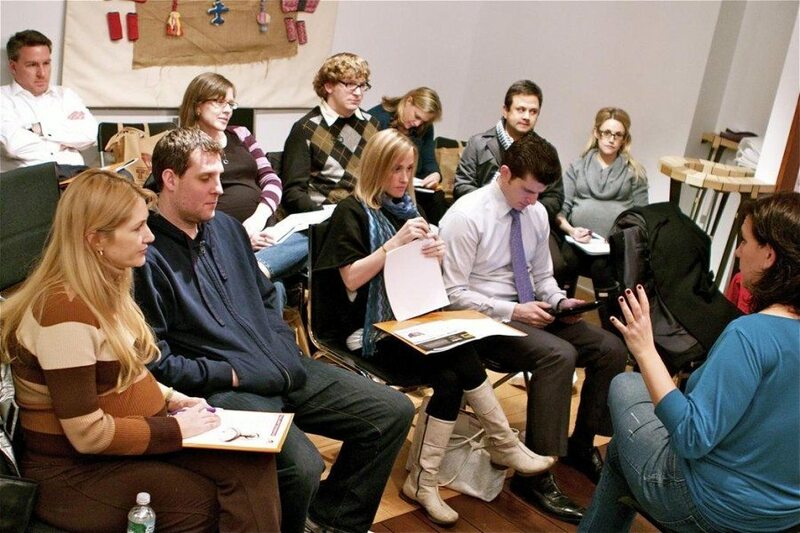 If you said, “YES!” to any of those questions, then the Twiniversity Parent-to-Parent Mentorship Program is perfect for YOU! We are looking for parents of multiples from around the globe who want to be matched up with a parent mentor, or who want to BE a parent mentor. We’ll be matching up moms with moms and dads with dads from all over the world to get personal support in this crazy life of multiples parenting!! All you have to do is complete a simple application form and we’ll do the matchmaking! And the best part? The program is totally FREE! There are no fees to take part in this program. Ready to sign up? 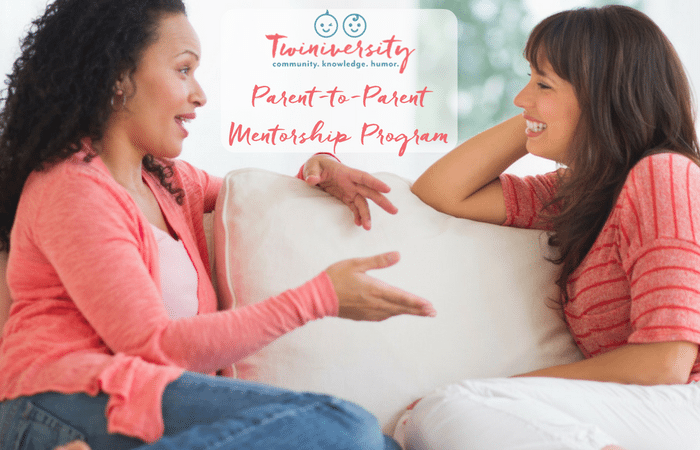 Visit the Twiniversity Parent-to-Parent Mentorship Page to learn how to apply!